President Trump is kicking off his first campaign rally of the year in El Paso, Texas, Monday night, less than a mile from a Beto O’Rourke rally expected to refute Trump's claims that a wall would be an effective security measure. What they're saying: During his State of the Union address, Trump said El Paso "used to have extremely high rates of violent crime, one of the highest in the country, and considered one of our nation's most dangerous cities ... Now, with a powerful barrier in place, El Paso is one of our safest cities." O'Rourke and other Texas politicians have refuted that, calling "El Paso ... one of the safest communities in the United States before the fence was built here." Reality check: "Before the border barriers were completed in El Paso, in 2008, the city had the second-lowest violent crime rate among more than 20 similarly sized American cities. In 2010, after the fence construction, it retained its ranking. Also, El Paso was never one of the most dangerous cities in the United States," reported the New York Times. O’Rourke intends to "show the country the reality of the border — a vibrant, safe, bi-national community that proudly celebrates its culture, history, diversity and status as a city of immigrants,” the organizers of the rally told ABC News. Trump campaign officials have said the location of the rally is intended to highlight the border wall's usefulness. 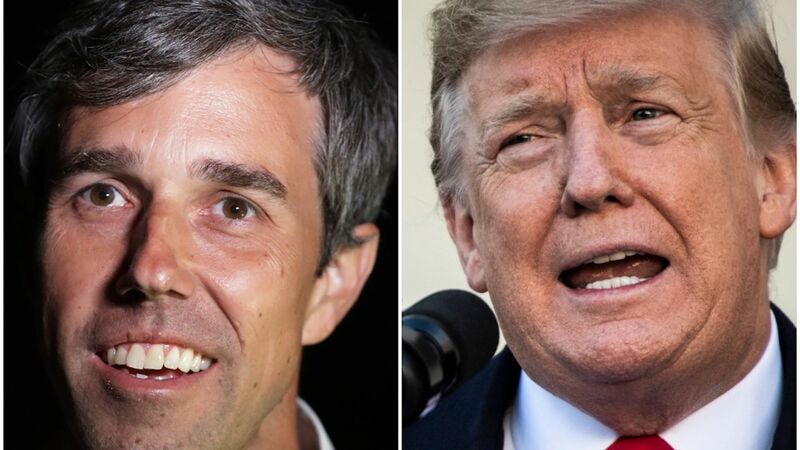 The big picture: Both Trump and O'Rourke have called each other out publicly before and in a preview of the rally. O'Rourke has said he "will meet lies and hate with the truth," while Trump called O'Rourke a "Flake!" and "a total lightweight." O'Rourke has long been critical of Trump on issues ranging from immigration to his attitude on Russia. Impeachment: O’Rourke has said on multiple occasions he would vote to impeach Trump. Russian collusion: "To quote George Will — very conservative columnist — when we saw him on that stage in Helsinki defending Vladimir Putin, the head of the country that attacked our democracy in 2016 instead of this country, and its citizens and this amazing democracy, that was collusion in action." Obstruction: "When, by broad daylight on Twitter, he asked his attorney general, Jeff Sessions, to end the Russia investigation, I would say that's obstruction in action." Crime and immigrants: O'Rourke has said immigrants in the U.S. "commit crimes at a lower rate than those Americans born here..." refuting Trump's claims that immigrants bring crime and drugs into the U.S. at alarming rates. Border walls: He has criticized Trump's fixation on a physical border wall: "...walls push desperate families to cross in ever more hostile terrain, ensuring greater suffering and death..."
Family separation: O'Rourke has criticized Trump's family separation policy: "We can either give into the fear of walls and tear-gassing families with infant children in diapers, we can go back to a policy of taking kids from their parents when they come here ... or we can live up to the best traditions, potential, promise and hope of who we are as Americans. That’s what’s in front of us right now." One nickname thing: O'Rourke borrowed Trump's nickname for Ted Cruz, O'Rourke's opponent in the 2018 midterms: "Senator Cruz is not going to be honest with you ... He’s dishonest, and it’s why the president called him Lyin’ Ted, and it’s why the nickname stuck — because it’s true."